Condominium residents at 15330 Albright, whose balconies face Sunset across the alley from Ogden Cleaners, had a rude awakening on Oct. 26. In the alleyway near their building, Frontier Communications workers were digging a hole in order to install a new telephone pole less than 10 feet from an existing utility pole. “They don’t see people living here, so they think it’s the back of the building,” said Amy Soufo, who has lived in a ground-level untit with her husband Eli (the Shell auto mechanic) since 1986. The Soufos and other residents in the building will have their views impaired by the new pole. Neither the homeowners association nor the residents were notified about the new pole, nor the reason it was going in. 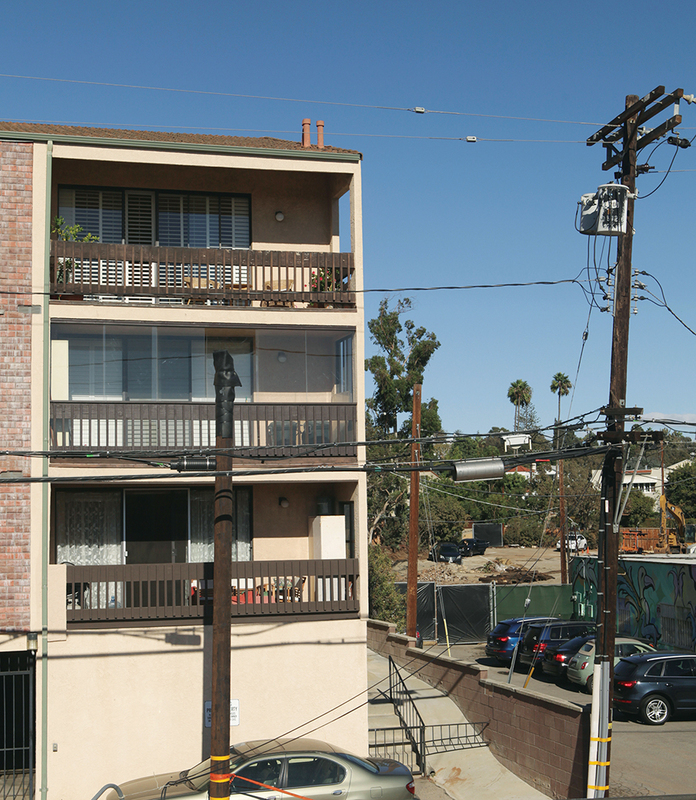 On nearby Swarthmore, DWP workers were installing new electrical wiring. Earlier, a spokesperson told the News that the electrical poles at the former Swarthmore parking lot needed to be moved in order to dig Caruso Affiliated’s underground parking garage. Temporary power poles were placed around the perimeter of the Caruso project, including on Monument Street, with plans to eventually place utility wires underground. Condo residents Will Maguire, Alan Beck and Amy Soufo sought out Caruso engineer Kevin Wheeler in front of the P2 skate shop on Swarthmore on Oct. 27. Maguire and Beck said that nobody in the homeowners association had been notified and that they had asked Frontier to produce a permit, but hadn’t received one yet. Wheeler walked with the residents over to the site of the proposed pole on the alleyway. Wheeler continued to listen as the residents voiced their frustration. Then condo resident Michael Branch summarized the situation. “The pole is not strong enough because they [DWP] are taking out all the poles in the alley for the Caruso project,” he said. “Her unit will look out right at the pole,” Maguire said. Wheeler reminded him that when the project was done property values would go up. “The pole is temporary,” Wheeler said.